Prior to the start of the Iraq War on March 19, 2003, New York Times journalist Chris Hedges (right) occupied a lonely perch among major media journalists. He opposed the war. Today, Hedges, a Pulitzer Prize winner and now a columnist for the website Truthdig, continues to write with the passion of a man set free from corporate control. His latest posting is a perceptive analysis of both the role this nation’s political and media “liberal hawks” played in launching the Iraq war, and the “rewriting of history” by those “liberal hawks” on the 10th anniversary of the start of that war. In his Truthdig column, “The Treason of the Intellectuals“, Hedges asks, how did the liberal Iraq war boosters react to the tenth anniversary of the war they initially supported? Some claimed they had opposed the war when they had not. Others . . . argued that they had merely acted in good faith on the information available; if they had known then what they know now, they assured us, they would have acted differently. This, of course, is false. [They] did what they always have done: Engage in acts of self-preservation. To oppose the war would have been a career killer. And they knew it. . . .
Those of us who spoke out against the war, faced with the onslaught of right-wing “patriots” and their liberal apologists, became pariahs. In my case it did not matter that I was an Arabic speaker. It did not matter that I had spent seven years in the Middle East, including months in Iraq, as a foreign correspondent. It did not matter that I knew the instrument of war. The critique that I and other opponents of war delivered, no matter how well grounded in fact and experience, turned us into objects of scorn by a liberal elite that cravenly wanted to demonstrate its own “patriotism” and “realism” about national security. The liberal class fueled a rabid, irrational hatred of all war critics. Many of us received death threats and lost our jobs, for me one at The New York Times. These liberal warmongers, 10 years later, remain both clueless about their moral bankruptcy and cloyingly sanctimonious. They have the blood of hundreds of thousands of innocents on their hands. The power elite, especially the liberal elite, has always been willing to sacrifice integrity and truth for power, personal advancement, foundation grants, awards, tenured professorships, columns, book contracts, television appearances, generous lecture fees and social status. They know what they need to say. They know which ideology they have to serve. They know what lies must be told—the biggest being that they take moral stances on issues that aren’t safe and anodyne. They have been at this game a long time. And they will, should their careers require it, happily sell us out again. Hedges writes that the initial war boosters included Senators Hillary Clinton, Chuck Schumer, Al Franken and John Kerry. These Democratic political leaders who voted to give President Bush authority to launch the war, were joined by academics, writers and journalists, including Bill Keller, Michael Ignatieff, Nicholas Kristof, David Remnick, Fareed Zakaria, Michael Walzer, Paul Berman, Thomas Friedman,George Packer, Anne-Marie Slaughter, Kanan Makiya and the late Christopher Hitchens. Despite their support for a war that proved to be a disastrous mistake, the academics, writers and journalists listed above—with the exception of Hitchens— have retained their positions as major commentators. Two of the political war boosters, Senators Clinton and Kerry, were later elevated to cabinet positions in the Obama administration. A decade later, these liberal war enablers, their careers unhindered, remain leaders within the same liberal class that endorsed the Iraq war. This means, of course, that they continue to promote the same dominant Israeli Middle East narrative of the nation’s liberal ruling class. The liberal class, in fact, is used to marginalize and discredit those, such as Noam Chomsky and Norman Finkelstein, who have the honesty, integrity and courage to denounce Israeli war crimes. And the liberal class is compensated for its dirty role in squelching debate. Saïd, who died at age 68 on September 25, 2003, six months after the start of the Iraq War, was a Palestinian–American literary theoretician who was an advocate for the political and the human rights of the Palestinian people. British journalist Robert Fisk described Said as “the most powerful voice for the Palestinian people”. Said was the University Professor of English and Comparative Literature at Columbia University, and a public intellectual who was a founding figure of the critical-theory field of Post-colonialism. Hedges searched for appropriate quotations on the liberal class avoiding social issues. He found one in the penultimate of the four British Reith Lecture series : Speaking Truth to Power, which Said delivered in July and August of 1993. The lectures were broadcast by the BBC. They have since been archived on the internet. You do not want to appear too political; you are afraid of seeming controversial; you want to keep a reputation for being balanced, objective, moderate; your hope is to be asked back, to consult, to be on a board or prestigious committee, and so to remain within the responsible mainstream; someday you hope to get an honorary degree, a big prize, perhaps even an ambassadorship. Personally I have encountered [these habits] in one of the toughest of all contemporary issues, Palestine, where fear of speaking out about one of the greatest injustices in modern history has hobbled, blinkered, muzzled many who know the truth and are in a position to serve it. For despite the abuse and vilification that any outspoken supporter of Palestinian rights and self-determination earns for him or herself, the truth deserves to be spoken, represented by an unafraid and compassionate intellectual. Chris Hedges and Edward Said have traveled different paths to reach their shared passion regarding Palestine. Hedges, 56, is the son of an American Presbyterian minister. He holds a B.A. in English Literature at Colgate University. He later earned a Master of Divinity from Harvard Divinity School, where he studied under James Luther Adams. Hedges is the author of Death of the Liberal Class, The World As It Is: Dispatches on the Myth of Human Progress, and War is the Force that Gives Life Meaning. His 2012 best seller, written with the cartoonist Joe Sacco, is Days of Destruction, Days of Revolt. After receiving the reprimand, Hedges left the paper. He is currently a senior fellow at The Nation Institute in New York City. At the Times, he worked for nearly two decades as a foreign correspondent in Central America, the Middle East, Africa and the Balkans. Paul Craig Roberts includes Hedges in his list of “rebels” who speak the truth to power by exposing as false, elements of the prevailing public narrative. Roberts describes his list as “offensive” to defenders of the establishment’s status quo. While Edward Said, unfortunately, is no longer with us, Chris Hedges continues his “offensive” fight against the “might makes right” ideology that led to the Iraq War. One of his recent media appearances is available in a nine-minute video interview from the Real News Network. 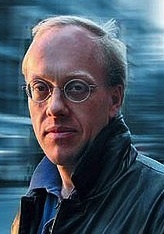 The photo of Chris Hedges at top is from Wikipedia. 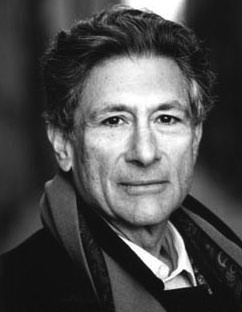 The photo of Edward Said is from http://www.tumblr.com. This entry was posted in Hillary Clinton, Media, Middle East Politics. Bookmark the permalink. Jim, Thank you. You have succeeded again in bring to light many issues of the Iraq War and people who remain somewhat in the shadows of our memories. I lived in a small town in North Carolina at the time of the Iraq war runup when we demonstrated in black outside the courthouse against the war. We were all so disappointed when bombs were dropped. What a terrible tragedy for both Iraq and the United States. And still those in charge maintain it was necessary. How blind, cruel and terribly wrong they were and still are. i have a memory of a meeting at the university of denver (where i work) – it was in jan or feb, 2003, just before the war against iraq was launched. these guys – they were all guys – were the so-called experts on nuclear policy, weapons of mass destruction…they were in a circle (and still are) of academics close to richard clark. in response to a question i posed, every last one of them assured me that 1. saddam was building a nuke, 2. saddam was building weapons of mass destruction, especially chemical weapons. these same guys are now being interviewed on results of the war now ten years on. not one of them (that i am aware of) had the decency, courage to admit they were wrong. all of them have justified in the war in one pathetic way or another. Jim, thanks for a superlative, and essential, commentary. The “liberal hawks” pilloried so well by Chris Hedges, along with too many others in government, the media, academe, U.S. Christianity et al, have no intellectual or moral or any other integrity when it comes to any thought of opposing the dictates of political/militant Zionism. The most striking feature of the Iraq War from the beginning is that it was authorized by large bi-partisan majorities in both the House and the Senate in Congress. It was authorized by Congress, Democrats and Republicans alike, despite the fact that we had reports from Hans Blix, after 750 inspections, that Saddam Hussein had no weapons of mass destruction. It was authorized by Congress, Democrats and Republicans like, despite the obvious military risks of becoming entangled in a ground war over a large area in which strategic retreat would be impractical once undertaken. It was authorized,by Congress, Democrats and Republicans alike, despite the fact that we had clear military alternatives that would have been less expensive, entailed no casualties or risks. And it was authorized by Congress, Democrats and Repûblicans alike, despite luke warm public support, notwithstanding a huge media offensive to promote the invasion. It was obediently authorized by Democrats and Republicans alike because the major media of the United States demanded the war, and because the Israel Lobby wanted the invasion. It is fine to beat our breasts and blame the Republicans who slavishly supported this remarkably stupid military undertaking. But why has it taken so long for Democrats also to take responsbility for this folly? And bad as Bush was, he at least observed the War Powers Act, and dragged Ariel Sharon kicking and screaming to the peace conference at Aqaba. It was Obama who cynically disregarded the War Powers Act in Libya, and now cynically disregards the same indispensable safeguard against unjust and unnecessary wars in Syria. — John Remington Graham of the Minnesota Bar (#3664X) . . It is a shame that we have, as a nation, due to our brutal and inhumane foreign policy of making preemptive war,become as cruel, denying human rights and due process, as those nations we deemed dictatorshops or totalitarian entities to whom we (thought we)were superior because of our perfect democracy. The U.S. now stands for lack of habeas corpus, Torture, Inhmane treatment of prisoners, use of unbelievably horrible weapons and denying prisoners trials. while still thinking itself an example to others of pure democracy modclaimed to be without because of our democratic and freedom and tolerant purity. pursued in order to divert the world attention away from the harshest and only colonial occupation of Palestine to date, and so there will be no just peace for the Palestinians. Those molders of public opinion are leaving no good legacy for their intellectualism, professionalism, and moralism . History will never forgive them if written by the good historians. We hope there will be no mythical anthrax. You have helped us–and the President–to see the essential lesson of Iraq and Afghanistan: it is we, the only nation to have used atomic power, who have the weapons of mass destruction. May our “friends” help us see ourselves for who we are! Thank you, Jim, for your courageous exposure of “silence of the Lambs”. The silence, or moral cowardice, has led to hundreds of thousands of Iraqis killed in an immoral vastly asymmetrical invasion. There were 1 1/2 million who died in the barbaric sanctions alone, that included about 500,000 children. The invasion of Iraq was built entirely on lies and deception. The media was a critical part of the game in spreading fear tactics that were sourced by the Administration’s supporters and AIPAC who gave the original direction for the destruction and dismemberment of Iraq. In the case of the occupation of Palestine, silence about injustice has reached immesurable proportions. The role of AIPAC and Israel and its supporters in the House and Senate, Democrats and Republicans is simply immoral and of criminal proportions. The Palestinian people and their supporters should come up with a creative totally different approach that will expose the truth and call for immediate action for justice. Just a word of thanks for bringing up the names of a couple of my heroes in the struggle for the Nation’s soul being waged in the wretchedly squalid American zeitgeist. The heroic Edward Said was and the incomparable Chris Hedges is the nonpareil of rationality, moral strength, personal valor and intellectual prowess. Thanks also to Mr. Stiver for bringing up the name of another old friend, the Washington Report On Middle East Affairs, for me an invaluable source of information on the issue of Palestine and on the Muslim world for a dozen years. What is so terrifying is that anyone who was conscious at the time, as opposed to being brain-dead, knew that the war with Iraq was totally and utterly wrong on any level that one could think of: morally, legally and, if those are not enough, from a simple common sense point-of-view. Launching a billion dollar a day (or whatever the cost) to remove one man from power was insanity, there is no other word that covers such an action, and that is before the tragic human consequences are taken into account. The countless deaths and horrendous injuries, on both sides, the utter destruction of a nation whose history went back into the mists of time were consequences that must have been foreseen by the criminal minds that were responsible, but were dismissed as being “collateral damage”, and to be expected. Even more terrifying is how few were the powerful media voices that were raised, and even more terrifying still is the fact that the excuses for the attack were so transparently false, yet it went ahead based on those lies. If no one else has noticed, the people running the show now are constantly demonstrating that they are prepared to do the same to Iran as was done to Iraq. If they are allowed to do so, we are all in very deep trouble, and for our children and their children, if they survive to have any, it will be even deeper. Our nation’s policies are in the hands of warmongers, war profiteers, neocons, and Israel Firsters who are dominant in our government and in the mainstream media–print, radio and telelevision. To change this will require courage, boldness, hard work, and, in the land of the almighty dollar—money, lots of it, to compete with those who are destroying our nation through endless wars, and being on the wrong side of justice.